Welcome to Day 7! In today's lesson we will learn how to rotate our bird, and how to scroll the grass and the skull pipe. This will involve making some changes to the Bird class, and creating new classes to represent our grass and the pipe. Rotation is controlled using the Y velocity. In our game, the bird accelerates downwards due to gravity (meaning that the velocity increases). When our velocity is negative (meaning that the bird is moving upwards), the bird will start rotating counterclockwise. When our velocity is higher than some positive value, the bird will start to rotate clockwise (we don't start rotating until the Bird starts speeding up a bit). One thing we have to pay attention to is the animation. The bird should not flap his wings when falling. Instead, his wings should go in the middle position. Once he starts rising, he will start flapping again. We will use the isFalling method to decide when the bird should begin rotating downwards. 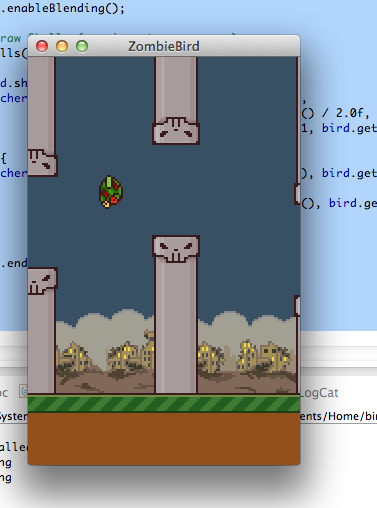 We will use the shouldntFlap method to determine when the bird should stop animating. - Next, we need to make some changes to the update method. Recall that we have a float called rotation, which will keep track of how much our bard has rotated. We will say that a positive change in rotation is a clockwise rotation and that a negative change in rotation is a counterclockwise rotation. Add these two blocks of code to the end of the update method. They will handle the counterclockwise and clockwise rotations (rising and falling). Note that we scale our rotation by delta, so that the bird will rotate at the same rate even if the game slows down (or speeds up, for that matter). Both of these if statements have some kind of cap on rotation. If we rotate too far, our game will correct that for us. Great. Now that we've gotten that taken care of, all we need to do is go to the GameRenderer and use the shouldntFlap method to determine whether the bird should animate or not. I've recently discovered that the method Vector2.cpy() creates a new instance of a Vector2 rather than recycling one instance. This means that at 60 FPS, calling Vector2.cpy() would allocate 60 new Vector2 objects every second, which would cause the Java garbage collector to get involved every frequently. Just keep this in mind as you go through the remainder of Unit 1. We will solve this issue later in the series. Each time that the render method was called (about 60 times per second), we were asking our game to find myWorld, then find its Bird object, return it to the GameRenderer to put it on the stack as a local variable. Instead of doing that, we are going to retrieve it once when the GameRenderer is first created then store the Bird object as an instance variable. We will be doing the same thing with our TextureRegions from AssetLoader and for any future objects that we create. Now try running the code! Your bird will flap his wings and rotate, exactly as we intended. - We will use 3 pipes (each column will be considered one pipe object). - We will use 2 long strips of grass, attached to each other horizontally. - When each pipe or grass scrolls to the left (is no longer visible), we will reset it. - To reset the grass, we will simply attach it to the tail (the end) of the other piece. - To reset the pipe, we place it at a fixed distance from the pipe that is furthest back, and reset its height. Notice that pipes and grass behave in very similar ways. Because of this, we can take their common traits and create a Scrollable Superclass with them, and then use inheritance to create the more specific Pipe and Grass objects. The reseting part can be tricky. - Pipe 1, when resetting, should go behind Pipe 3. - Pipe 2, when resetting, should go behind Pipe 1. - Pipe 3, when resetting, should go behind Pipe 2. Rather than give each of these objects a reference to the other pipes, we will simply create a ScrollHandler object that will keep a reference to all of these objects and determine where each should go. This will make things a lot easier. We begin by creating a Scrollable class (inside com.kilobolt.gameobjects) which we will use to define all the shared properties of the Pipe and the Grass objects. position, velocity, width, height, and the boolean isScrolledLeft to determine when the Scrollable object is no longer visible and should be reset. update and reset, and getter methods for various instance variables above. // Protected is similar to private, but allows inheritance by subclasses. // Reset: Should Override in subclass for more specific behavior. The two above classes (when we say Pipe p = new Pipe(...) or Grass g = new Grass(...)) will create themselves using the Scrollable constructor (by inheritance), and also add some of their own properties (in the case of Pipe, a new instance variable and a new method). What is @Override and super? In inheritance, the subclasses have access to all the methods in the superclass. This means that Pipe and Grass are both able to reset even if we don't define the method specifically inside the Pipe and Grass classes. This is because they are extensions of Scrollable which does have the reset method. g.reset(); // Reset method from scrollable is called. However, if we want more specific behavior than the one described in the superclass, we can use: @Override, which basically says: use this reset method inside the subclass rather than the reset method in the superclass. We are doing this inside the Pipe class - we are replacing the original reset method from the superclass with a more specific one in the subclass. p.reset(); // Reset method from Pipe called. Even when Overriding, the subclass still has a reference to the superclass's original reset method. Calling super.reset(...) inside the Overridden reset will mean that both reset methods are called. Why do we need a Grass class? Grass, above, is really a worthless class right now, because it has no properties of its own. But we will later add some properties for collision detection and thats why it gets its own class. Now that our Scrollable classes are ready, we can implement the ScrollHandler, which will take care of creating these Grass and Pipe objects, updating them, and handling reset. Create the new ScrollHandler class inside com.kilobolt.gameobjects. - We need a constructor that receives a y position to know where we need to create our ground (where the grass and the bottom pipes will begin). - We need five instance variables: 2 for two Grass objects and 3 for three Pipe objects (for now, we will treat each column of pipes as one Pipe object). - We need getters for all of these. - We need an update method. // ScrollHandler will create all five objects that we need. // the size of the gap between each pair of pipes. // Capital letters are used by convention when naming constants. // Grass and Pipe objects. The logic here is simple. Remember that our Scrollable objects' constructors want : x, y, width, height and scroll speed. We pass each of these in. The backGrass object should be attached to the tail of the frontGrass, so we create it at the frontGrass' tail. The Pipe objects follow a similar logic, except that we add the PIPE_GAP to create a gap of 49 pixels (experimentally determined). 2. Render the ScrollHandlers' five objects inside the GameRenderer. Open up GameWorld. We are going to make a quick change. - Create a getter for the Scroller (return the ScrollHandler scroll). 5 for the 3 pipes + 2 grass objects. - Add the following in BOLD below the declaration of the Bird object. The pixel values (widths/heights/etc) you see have been added after careful measurements. I thought you would prefer seeing hard coded values to deriving them yourself! // We will fix this when we finish the Pipe class. I labeled the three changes inside the render method using 1... 2... 3. Thank you very much for reading, and congratulations! We now have everything that we need to render. Time to start working on collision. Join me in Day 8! Source Code for the day. Like us on Facebook to be informed as soon as the next lesson is available.